Inside the camping, in addition to basic services such as sinks, showers, toilets, chemical toilet, camper service, columns for electrical installation and columns for loading water, there is a BAR with a large terrace and a large screen for the transmission of the most watched television events and a well-stocked MARKET, where you can get fresh groceries and a wide range of useful articles for the campers and for the bather. 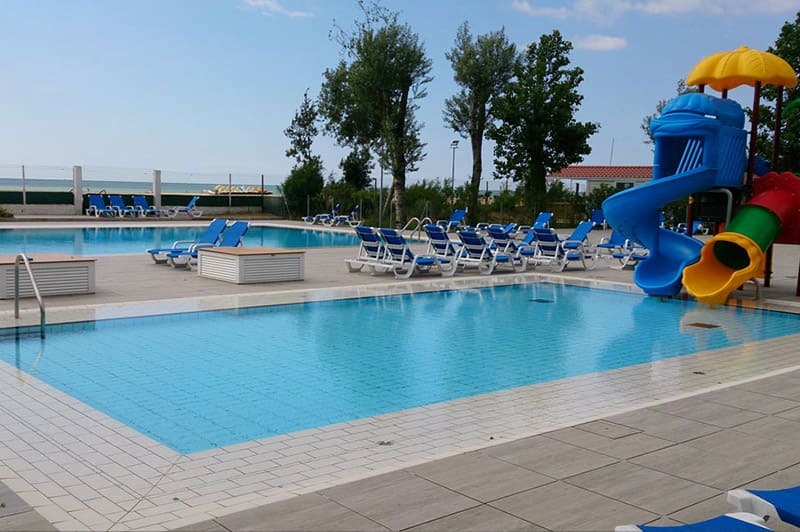 Guests of the new camping area POOLS BEACH FRONT, with heated pool for adults and pool for children. The solarium of the pools is equipped with comfortable beds made available for campers. 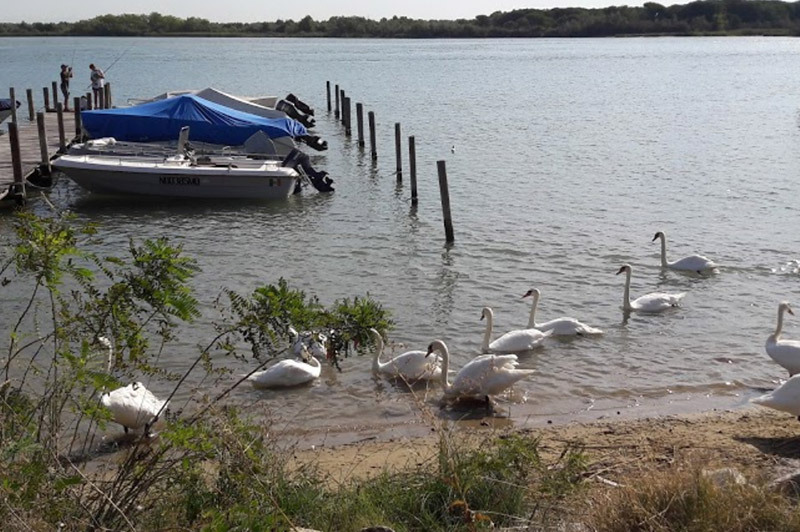 The Falconera Camping has a wooden pier where guests can dock their boats. The berths can accommodate rafts and small boats maximum measuring about 6 meters. The use of moorings is subject to the rates provided for in the price list and must be strictly arranged with the management. The pier is adjacent to the campsite and is located on the lagoon side, a hundred meters from the outlet to the sea. It is easily reached from inside the camp through a special gate. At the RECEPTION you can buy TICKETS FOR URBAN BUS for both races for both the outward and is combined return BUS AND BOAT TO VENICE. The bus stop is a few dozen meters from the entrance of the camping. 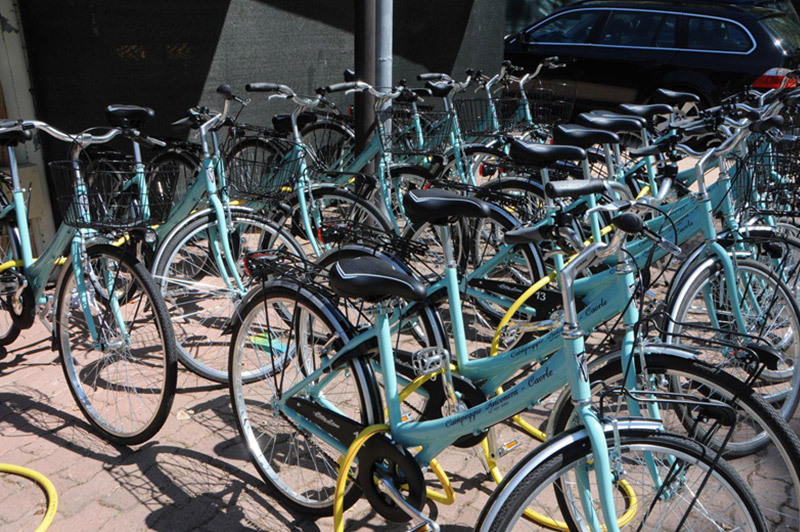 Alternatively you can opt for the bus BIKE RENTAL, always at the reception, where you can also obtain information and directions of various kinds. The office also works to advance DISCOUNTED TICKETS for the WATER PARK Aquafollie. And as resale ticket to the WIFI service Caorle wifi. From local services are placed at the entrance WASHING and DRYER. Dogs and other pets are allowed throughout the campsite, excluding public places such as swimming pools and toilets. The owners must comply scrupulously with the provisions of the Regulation, which can be consulted on this site under “Animals”, in the “REGULATION” section. In correspondence of the toilets are placed the columns with bags dispenser for collecting the excrements and the container for the disposal of the same. Adjacent to the incoming services block is located a washing step with hot and cold water. A few hundred meters from the campsite there is the “Bau Beach”, an equipped beach ad hoc. The behavior of the animals on the beach must be in compliance with the provisions of current order of the Harbour Master.